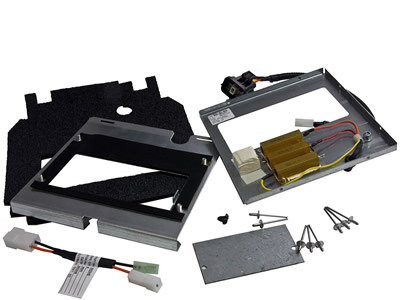 This kit can be used for cars which have been equipped with the heater fan resistor A117P6000S. From MY07 VIN 2042 on Heater cars and MY07 VIN1951 in A.C. cars, the heater fan has already been upgraded with this kit! The heater fan resistor was originally placed in a position which was prone to oxidation. We have seen quite a lot of cars where the pins of the original heater fan resitor were completely rusted away. Problem is that replacing the resistor doesn't solve the problem. Within a few years, the problem will come back and will lead to another (expensive) repair job. This is the original Lotus Service Replacement kit which allows you to solve the problem permanently by sealing some areas of the heater/evaporator/blower unit and by placing the resistors in a different position. The kit will be delivered including the Service Bulletin which describes the installation of the kit.